Thank you for choosing Telerik RadExpander! 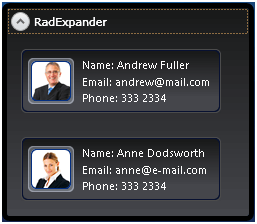 RadExpander is a flexible control that helps you save space and achieve easier navigation through your site. You can place the expander anywhere on your page and embed any content inside its drop-down area. You can also change the RadExpander's ExpandDirection to better suit your custom layout.